So many great chapters for this class, and so many great ideas along the way. Emphasis for me has always been a challenge, and now I have tools to help guide me- along with a checklist! I can so easily see where I have gone 'awry' with some of my art pieces without knowing why or what was wrong. The fog has lifted! This was such a great course! It was amazing getting to immerse myself in the thought process' of these wonderful artists. They covered so much excellent material. Thank you so much! Talking about composition: This course is extremely well composed! Love the way and pace in which Will touches all the important areas. I wish I learned these things at Uni, and even if I could guess some of them, it's so valuable to put them all together. Great course, thank you! This course was extremely helpful. I learned so much about making dynamic illustrations. This course really helped me become super aware of composition and value. I will probably go back and re-watch parts of it for reminders. I learned more from this class than I did in my college classes from years ago. This is the first course I watched (and finished) after subscribing about a month ago, and I really liked it. The checklist and workbook are great resources and I'm putting them to use. Watching Will, Jake, and Guy work and talk through their process was very insightful. The critiques were also really valuable. Looking forward to watching more videos. Great course! Quite thorough! Better than any of my college art classes! Thank you so much! I have been looking for something exactly like this. Simple and understandable. And the checklist is like you were reading my mind. This is a must-watch for anyone who wants to really understand what composition is all about. It has been of tremendous help for me and I have watched it twice to get the most of it. I think I'll watch it again for better retention. Totally recommendable. As soon as you said you need a process, you had my complete trust and admiration. I'm a writer who believes in process. But tell that to other writers (some, anyway) and they will call you a hack. In fact, a process is a professional's most important productivity tool. I loved everything about this class. It reinforced some of what I already knew and opened my eyes to new ideas. Thank you!!! Thoroughly enjoyed viewing this course, and working through many of the exercises in the workbook. While some of it was refresher information to me, most of it was not, and watching and listening carefully to Will, Guy, and Jake work their way through to solutions, and solving problems could have been it's own course altogether. Loved this course. Loved it. I really liked how there was a main instructor with guest instructors. I think that dynamic helps flesh out the content and helps cover questions and problems that might not otherwise arise with a single instructor. I think sometimes instructors are so used to the subject matter they are teaching that they leave out things that might be confusing to a beginner, but I was very impressed to find that Will Terry is very sensitive to what might be confusing for a less advanced artist. It's an amazing quality to have in a teacher. It was also so useful to have a "working process" built in to this course. This is not just a theory course, but it has a lot of practical working examples and advice that I think is so much more helpful than theory itself. The workbook and exercises they have you do during the video portion are extremely helpful in solidifying the concepts. I've always struggled to implement a helpful working process with thumbnails, and this made it so much more clear and approachable. I highly recommend this course. Take it, and do the exercises! This class is so amazing. For artist who don't know much and want to just improve the way they create art. This creative composition helps. I've learned so many new things to help me. I struggled with composition and I feel like this class helped me understand the basics; probably more. Absolutely awesome course, covering the composition in a fun and relaxing way. This class is the medicine you need whether you know it or not. This is the prescription that will make you better, the exercise that will make you faster, the vegetables, the antioxidants of art. Most beginning artists don’t know they need it or find it difficult and skip it to the detriment of their art. 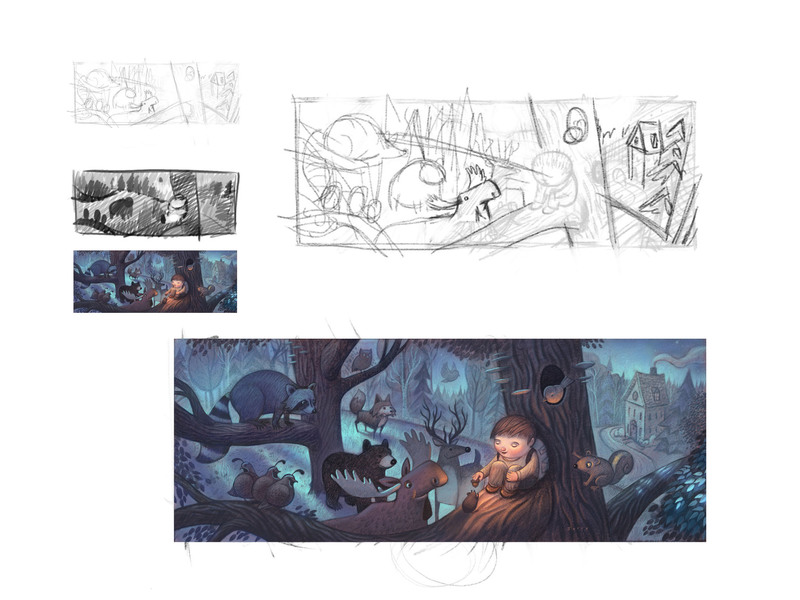 Making a great illustration requires good drawing and rendering skills, BUT, many don’t realize that there’s a preliminary process that MUST take place first. Composing the image is essential to creating a beautiful painting, illustration, graphic novel image, comic panel, or book cover image. Drawing characters, objects and environments accurately and in proportion is a good foundation to making a great image but it’s only part of what you need. Putting everything together to create a complete image with effective eye movements, balance, focal points, legibility, and communication requires good design skills.